There is something elegant about a simply executed three hand watch. 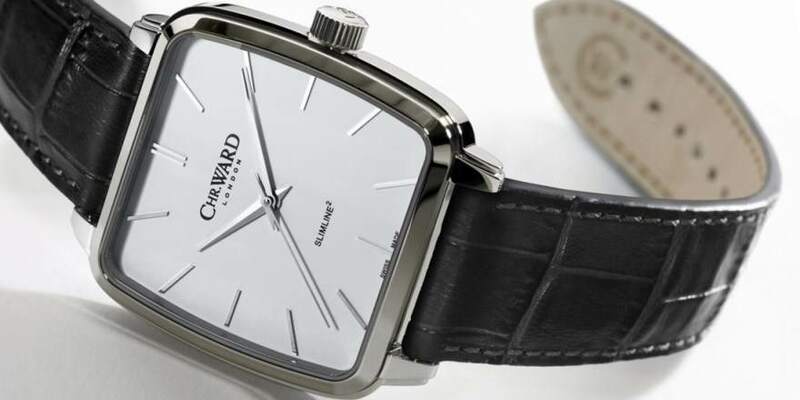 And the new Christopher Ward C5 Malvern Slimline Squared (or Slimline² for the mathematically inclined) is certainly elegant. Now available for pre-order (watches will ship in mid-February) for $549 on your choice of straps, this is a dress watch for everyone from a recent graduate to the executive that cares more about the watch than the brand. Fitting for a dress watch, a more intimate choice of timepieces, the Christopher Ward C5 Malvern Slimline Squared uses a hand wound movement, the Swiss Sellita SW210-1 with Côtes de Genève finishing on the bridge visible through the caseback. While the bridge does take up a lot of real estate in the window, the blued screws, jewels and movement of the gear trail are far more visible with the hand wound movement than they would be with an automatic. I have one hand wound watch, along with more automatics than winders, so I end up hand winding my collection anyway, which connects me to the watches more than just looking at them lined up and deciding what to wear. I expect the finish on the watch to be well done, as it is with the CW that I own and the Trident I reviewed hands on. The sunburst dial is very well done, and the not-quite square case is good for those that still want a little curve in their watch case. The watch case is 37mm x 37mm and, as fitting the name, a slim 8.25 mm thick. Who we think it might be for: You want a nice mechanical dress watch without spending a ton of cash. Would I wear one myself based on what I’ve seen? : Yes. I don’t need a dress watch very often, but this would be a great choice. If I could make one design suggestion, it would be: I wonder how it would look with blued hands. What spoke to me the most about this watch: The pretty sunburst finish.